With a relaxed island vibe, postcard-perfect beaches, and cascading waterfalls, the Hawaiian island of Maui draws about 2.4 million visitors per year. The vast majority of them stick to the western resort areas of Wailea, Lahaina, and Kapalua — and don’t venture further east than Haleakala National Park. 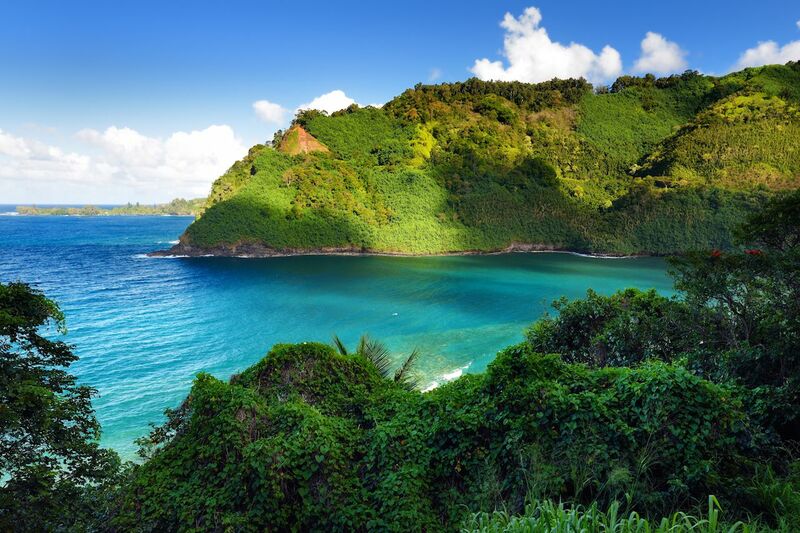 The Road to Hana takes you away from those busy resorts to one of the most secluded towns in America. Although the highway draws 1,500 or more cars per day, few travelers go all the way to Hana. That’s understandable: With its tight, fist-clenching turns and narrow passages, it’s not exactly an enjoy-the-passing-scenery type of excursion. That said, for the adventurous traveler, the drive is more than worth it. Here’s how to make it happen. The journey follows State Highway 36 and HI-360 for 52 miles from the hippy enclave of Paia to Hana Town. The journey isn’t exactly off the beaten path, but it gives you a chance to break from the crowds that populate the western part of the island. If you buckle down and commit to the drive — which can be done as a day trip or an overnight — you’ll lean into a total of 620 curves and cross 59 bridges en route to Hana. You’ll take in coastal views, bamboo forests, and waterfalls, and you’ll pass plenty of places to stop and refuel on fresh fruit or local cuisine. Google Maps puts the drive time at about two hours, but that won’t happen unless you make the journey on a day when travel on the road is exceptionally light. Plan at least one full day, and wake up early to hit the road. You have two options for getting yourself from Paia to Hana. Option one is to sign up for a guided tour where you and your group pile into a van with other tourists and ride in climate-controlled comfort down this legendary two-lane highway. You’ll stop for a quick photo at popular destinations but otherwise have little control over what you see, do, and eat along the way. Option two is to rent a car, preferably a 4×4, and make the trek yourself, spending as much time as you want at each stop and pulling over to buy fresh fruit whenever the craving sets in. The true adventurer should opt for this route. You can go out and be back in time for a nightcap cocktail at your resort. Just be sure you haven’t stopped at every viewpoint on your way to Hana; leave some for the return trip. If you do have time for an overnight, Hana has plenty of hotels and home-rental options, though they tend to be pricey. You can also camp in Waianapanapa State Park or other designated campsites in the area. The itinerary below doesn’t list every stop. Instead, it lets you experience a few places on a deeper level. Leave those gift-shop flip-flops at the hotel and bring a pair of Chacos or shoes that can handle a moderate hike. Be sure to load your pack with a rain jacket, plenty of water, and healthy snacks. Keep a hat and a good pair of sunglasses on your head, and, if you followed our advice and rented a 4×4, take the top down — because this drive is about to get downright epic. Crushing it on the road to Hana. 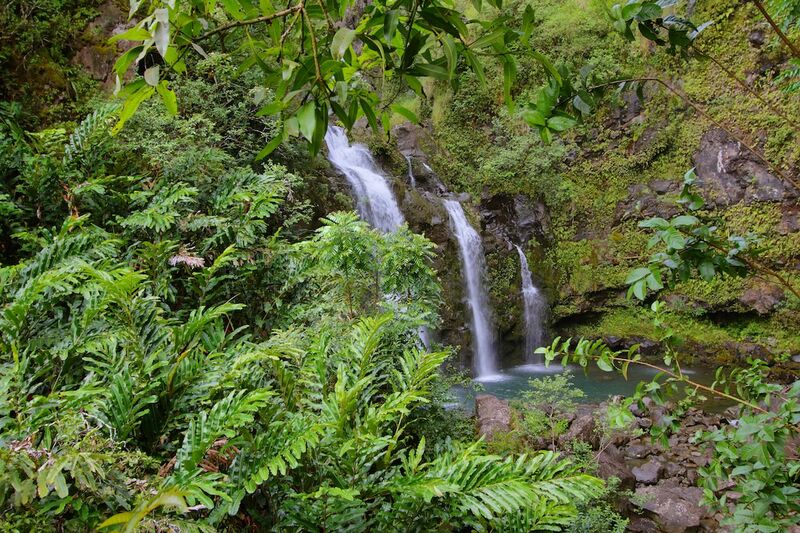 The first thing you should do after leaving Paia is make a quick stop at Twin Falls. The hike in is only one-mile round trip, but you needn’t spend much time there. Just up the road is a much more secluded, and as such much less crowded, waterfall. Find the little pull-off along the roadside at mile marker 6.7 on HI-360, noted on our map here as Na’ili’ili Haele Stream. 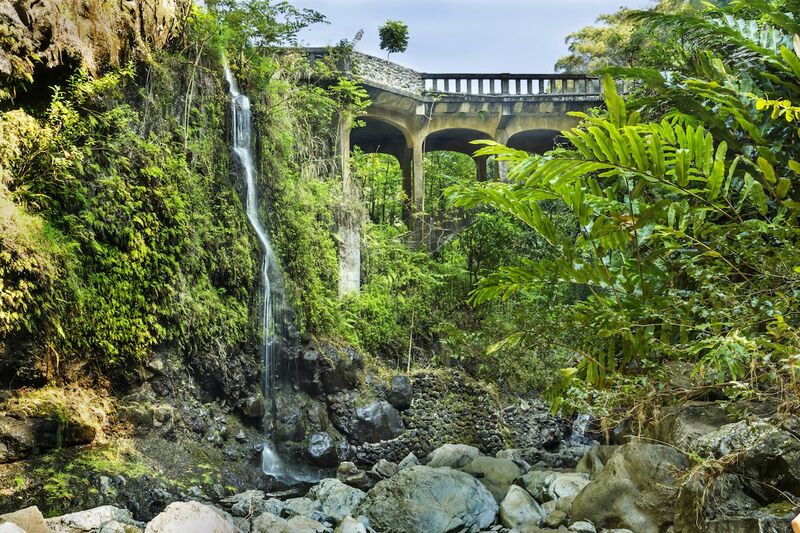 This is the trailhead for a hike that takes you as deep into the bamboo forest as you’re willing to go, complete with multiple options for a quick swim at gorgeous waterfalls and pools along the way. If you hike a few miles in and successfully wade across a couple pools, the reward is one of the top cliff-jumping spots on the island. There will likely be locals making the trek to this spot, meaning you’ll know when you get there. Avoid this hike if there have been recent flash floods, and check with East Maui Irrigation for any hiking permits advised for the area. Just up the road past mile marker nine is Waikamoi Ridge, a family-friendly hiking option with ocean views and a huge variety of local plants. The trail is well marked and easy to hike, and it takes as little as 10 to 15 minutes to make the stop worthwhile. For lunch, the Ko Haku Smoke Shack just up the road offers BBQ meats along with local veggies and fruits. It’s a solid way to eat local right on the highway. At mile marker 31, the botanical gardens at Kahanu Garden are the only way to take a photo of Pi’ilanihale Heiau, the oldest Hawaiian temple on the island. The gardens are located in a Pandanus Forest and feature a diverse collection of plant life from across the islands of the Pacific Ocean. 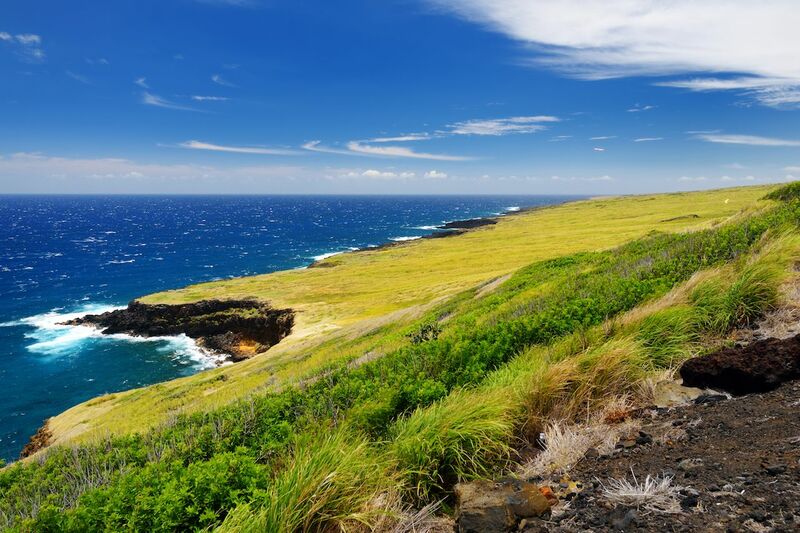 Another option for a good leg stretch just before reaching Hana is Waianapanapa State Park. Here, you’ll find plenty of hiking options, from leisurely family walks and picnic spots to more challenging treks along jagged, lava-lined coast. Take in the heiau, traditional Hawaiian religious temples, and snap photos of the stone arch and caves you’ll find along the way. Entrance is free unless you plan to camp. The majority of visitors to Hana return the way they came. This is a mistake, particularly if you have a good vehicle and some spare time. You can keep going down HI-360 south out of Hana around through Kipahulu to Kula and back to wherever you’re staying on the west side of the island. You’ll pass through the backside of Haleakala National Park, a landscape vastly different from the lushness of the main drive. Here, open fields give way to valleys carved from the volcano, with hardly a building in site. You can hike through the Kipahulu Valley in the park. The top attraction on this side of the drive is the Pools of Ohe’o, though they’re currently closed due to landslides. Check with the National Park Service for current information and updates on what is open. This side also has rock beaches and cliffs, Pu’u Maneoneo petroglyphs and ruins, and the 50-foot-tall Alelele Falls. What to do in Hana. While the road to Hana is certainly one of those ‘the journey is as important as the destination’ type of adventures, there’s no shortage of things to do once you arrive. While small, Hana Town is full of Hawaiian charm and culture. You can snorkel at Hana Bay; near the pier, you’re likely to see turtles and a variety of colorful fish. At Hamoa Beach, you can also relax on the sand and savor the scenery. The jaunt up to Fagan’s Cross, a cross honoring the man who brought cattle ranching to this part of the island, takes you uphill above town and gives you sweeping coastal views. For a less trodden path, start at the same trailhead but take the left fork four miles through Hana Ranch to Haneo’o Road, a trek that offers striking panoramic views of the region. Hana has numerous farmers’ markets throughout the year, and you can sample local produce at several fruit stands and markets. Stop by the Hana Cultural Center and Museum and check out the historic courthouse and other old staples from the original settlement. Spend an hour or two meandering through the shops and galleries showcasing local art and artifacts of Hawaiian culture. When you get hungry, stop by one of the stands around town. Try local seafood, chicken dishes, or salads prepared entirely with ingredients from regional farms.